USANA manufactures and distributes premium nutritional products that are personalised to support the specific needs of the individual. More so than the products is the holistically healthy lifestyle USANA offers to its associates, shareholders, and employees. 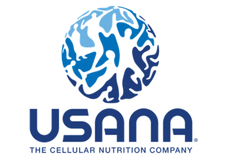 USANA serves in over 24 international markets and sponsors more than 2,000 elite and professional athletes worldwide. USANA employs and relies on more than 60 scientists—nutritional biochemists, molecular and cellular biologists, pharmacists, and sports science experts—to research and develop products based on the latest nutritional scientific discoveries. With a mission to develop and provide science-based health products of the highest quality and centered in values of health, excellence, integrity, and community – USANA is the bridge between living a good life to living the best life. Live your best life with #LiveUSANA and be part of the Healthiest Family on Earth!